The Republic of Rwanda is a country at the border of central and eastern Africa with a population of approximately 11.7 million (2012). Rwanda is just a few degrees south of the Equator, and is bordered by Uganda, Tanzania, Burundi and the Democratic Republic of the Congo. Most parts of Rwanda ae at high elevation, with mountains dominating the west, savanna grasslands in the east, and numerous lakes throughout the country. The climate of Rwanda is temperate; two rainy seasons and two dry seasons a year. With Christianity as the largest religion in Rwanda, and the principal language Kinyarwanda, Rwanda was colonized by Germany in 1884 and later invaded by Belgium in 1916 during the First World War. Both European nations ruled Rwanda through the Kingship and perpetuated pro-Tutsi policy who were dominant by then. In 1959 the Hutu population revolted, massacring a large number of Tutsi and ultimately establishing an independent Hutu-dominated state in 1962. The Tutsi-led Rwandan Patriotic Front launched a civil war in 1990, which was followed by the 1994 Genocide, in which Hutu extremists killed an estimated 500,000 to 1 million Tutsi and moderate Hutu. The RPF ended the genocide with a military victory that year. Rwanda’s economy suffered heavily during the 1994 Rwandan Genocide, but has since strengthened. The economy is based mostly on subsistence agriculture. Coffee and tea are the major cash crops for export. 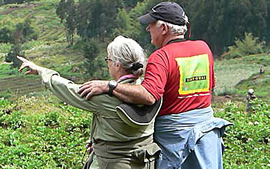 Tourism is a fast-growing sector and is now Rwanda’s leading foreign exchange earner; Rwanda is one of the only two countries in which mountain gorillas can be visited safely, and visitors are prepared to pay high prices for gorilla tracking permits. Music and dance are an integral part of Rwandan culture, particularly drums and the highly choreographed intore dance, Rwanda people, community and culture tour.